When you think of the West Coast of Wales, the first things that will more than likely spring to mind are the unspoiled beaches, beautiful vistas and undulating countryside. But dolphins?! Those local to the area will proudly tell you that the Ceredigion Coast is one of only two offshore areas in the UK that bottlenose dolphins call home (Moray Firth in Scotland being the other). An expanse of water known as the Special Conservation Area or SAC that stretches from Ceibwr to Aberarth is nothing short of a miniature tropical paradise - as well as dolphins, it houses grey seals, coral reefs and ancient sandbanks. Dolphins are inquisitive creatures and as such, are not only confined to the SAC area. Frequent sightings off the Aberystwyth coast have been reported, with the prime time for dolphin-spotting being throughout September and October. That's where we come in! We're only around 7 miles outside of Aberystwyth, so why not venture into the town and see if you can see any of our British bottlenose dolphins? With the temperature cooling, sunbathing may be off the menu, but dolphins are active in all weathers. They are social animals and like to gather in areas close to the coastline, so you may catch sight of them without leaving dry land! If you fancy a proper day out to get up close and personal, then a straight 40-minute drive south along the coast will take you to New Quay where frequent boat trips depart from the pier. Or, visit the Wales Coast Path site for information on spotting wildlife and other things to do along the Ceredigion coast. 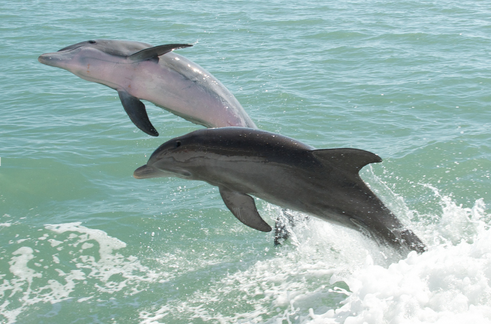 Spotting a dolphin is a wonderful, exciting experience, especially for families and children. If you see one, we want to know! Tweet or Facebook us your wildlife pictures so we can show them off to our friends online.